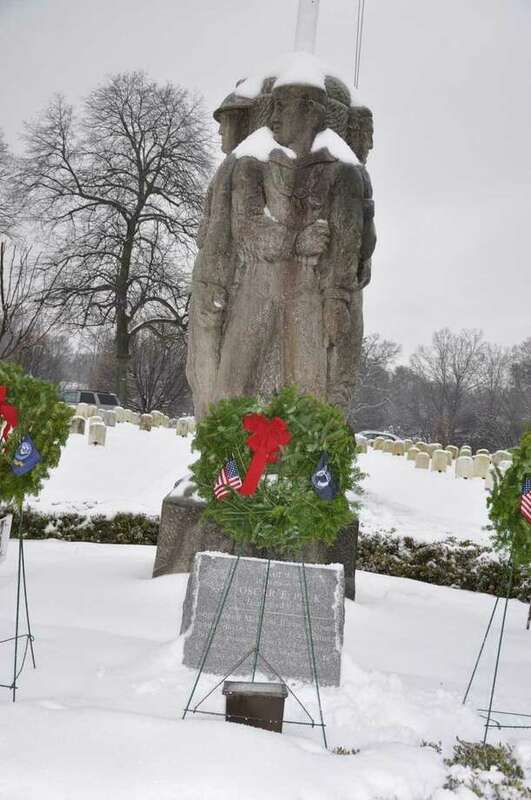 Ceremonial Wreaths surround Karl Lang Monument at Spring Grove Cemetery in Darien, Conn.
DARIEN — They say a person dies twice: once when they take their final breath, and later, the last time their name is spoken. That’s why everyone participating in Darien’s Wreaths Across America ceremony at Spring Grove Veterans’ Ceremony is asked to say the name on the tombstone as they lay a wreath at the grave of one of the 2,184 veterans buried there. On Dec. 16, Darien will hold its wreath-laying ceremony in conjunction with the ceremony at Arlington National Cemetery outside Washington, D.C. Started around 2005 in Darien, this year’s ceremony was organized with the help of the town’s Monuments and Ceremonies Commission, the Darien VFW Post #6933, the Masonic Club of Darien, Darien High School’s Support Our Soldiers club and and Good Wife’s River chapter of the Daughters of the American Revolution. The original wreath-laying ceremony in Arlington, Va. began in 1992, organized by a Maine businessman named Morrill Worcester. Soon, the practice spread and, now in its 26th year, Wreaths Across America is a nonprofit aiming to help carry out over 1,200 simultaneous wreath-laying ceremonies across the United States to encourage people to remember those who’ve served the country. Darien joined in when the group in Arlington began reaching out to veterans’ organizations across the country located near a veterans’ cemetery. Darien is home to the first veterans’ cemetery in the state due to Fitch’s Home for Soldiers, the state’s first veterans’ hospital, which was also started in the town. The public is encouraged to attend the Wreaths Across America dedication ceremony to be held at noon on Saturday, Dec.16, at Darien’s Spring Grove Veterans’ Cemetery on Hecker Avenue across from the police station. For more about Wreaths Across America, visit wreathsacrossamerica.org. More than a decade ago Wreaths Across America got in touch with the Darien VFW. This year, Polett said they raised enough money to put wreaths on 1,300 tombstones in Spring Grove Cemetery. Over the past several months, the Darien groups have been raising money for the wreaths, collecting donations in front of stores in town or online. Each wreath costs about $15, but Darien gets a discount through the Wreaths Across America nonprofit. In years past, Darien has had an anonymous donor who has given funds to supply wreaths for each grave. This year — without that donor — the group has fallen slightly short but has still collected a record number of independent donations, particularly considering the 60 some-odd wreaths they began with when they started participating in the ceremony. Polett said he’s now hoping townspeople turn up to place the wreaths. In the past, local Girl and Boy Scout troops and sports teams have shown up to help. Everyone in town is invited. Before the wreath laying begins, there will be a small ceremony where Phil Kraft, the location coordinator for the event and a member of the Darien VFW, will read off a speech that will be shared at all the ceremonies around the country and he will recognize the different groups in attendance. “It’s recognizing the sacrifice made by those who died and the responsibility to teach others so that they don’t make the same mistake and we don’t repeat war,” said Kraft, who served in the Vietnam War. Seven ceremonial wreaths will be placed to represent the six different branches of the military, as well as one for prisoners of war. Visitors can then help place the 1,300 remaining wreaths on different tombstones around the ceremony.